The first downloadable content (DLC) add-on for the hit game BioShock Infinite is now out for PC gamers. 'Clash in the Clouds' is available for $5 (£3.69) now on Steam. This DLC is, at its core, an arena battle mode for the game where you will get access to four new maps for battling through several waves of enemies to earn 'money'. Xbox 360 and PS3 DLC packs should also be available now in most regions. The four new maps are called The Raven's Dome, The Ops Zeal, Duke, Dimwit Theatre and Emporia Arcade. They offer different sky-high platforming architecture, challenges and foes. Another aspect of 'Clash in the Clouds' you might enjoy are the 'Blue Ribbon Challenges' where you have to defeat your enemies using pre-specified weapons or attacks. As mentioned in the introductory paragraph, meeting these challenges gets you 'cash', more skilful fighting will raise you even more cash. What do you do with this 'money'? You can unlock goodies in 'The Columbian Archaeological Society' museum as well as earn trophies and achievements, also you can participate in combat leaderboards. This is a teaser trailer and is very probably going to be followed up with more revealing video trailers as time goes by. You don't get to see much in the trailer, just a tiny bit of 40s style film noire detective agency storyline. It concludes with the line "We were all buried at sea, we just didn't know it yet." 'Burial at Sea' is expected to bring along all new environments and character interactions, in a Booker and Elizabeth unlike those that we have seen in the main game. You might call the environment a parallel world. Whereas 'Clash in the Clouds' focuses on action the following DLCs expand the story and emphasise narrative bringing the characters back to the Rapture location of the original BioShock. 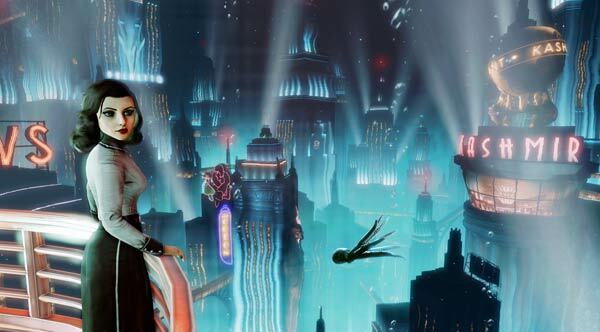 The LA Times reports that the second instalment of 'Burial at Sea' will bring closure to Elizabeth's story as well as BioShock Infinite itself. These two DLCs are the first of the three which are going to be available to buyers of the $19.99 'Season Pass'. GameSpot reports that this $4.99 initial 'Clash in the Clouds' DLC will be followed up by 'Burial at Sea - Episode 1' and 'Burial at Sea - Episode 2', which will retail initially for $14.99 each - so the Season Pass does offer some considerable savings in the short term. 'Clash in the Clouds' No thanks, even if cheap. Buried at Sea looks much more interesting though. Just hope they have a bit more interaction with the environment this time, and less of the 90s Wolfenstein linear run and gun of the original BI. The arena fighting is a surprising amount of fun. I wish the unlocks gave us some bonus things though. I thought the grammaphones might give us an mp3 of each song of something, but it seems they're only playable in the museum. These two DLCs are the first of the three which are going to be available to buyers of the $19.99 ‘Season Pass’. GameSpot reports that this $4.99 initial ‘Clash in the Clouds’ DLC will be followed up by ‘Burial at Sea - Episode 1’ and ‘Burial at Sea - Episode 2’, which will retail initially for $14.99 each - so the Season Pass does offer some considerable savings in the short term. I got a Steam popup on CitC and clicked through to watch the video. Looked interesting, but not enough to warrant spending the money. The other ones though might be worthwhile, in which case the Season Pass definitely is going to get bought. Just hope they have a bit more interaction with the environment this time, and less of the 90s Wolfenstein linear run and gun of the original BI. Dammit! I've obviously been playing it wrong then - thought there was more strategic thinking involved concerning the use of the vigors in attack/defence. Clash in the clouds is good fun, and Burial at Sea looks amazing. So glad I got the season pass for 30% off just over a week ago. No, you've been playing it correctly but you THOUGHT wrong. There is no strategy required for attack and defense but the game DOES allow you to give it a go for some fun and interesting results. I went through using solely the Machine Gun and Shock quite easily. Next playthrough in 1999 mode I deliberatly used combos and such and it was a better playing experience all round.